Learn how to avoid beach hazards. UC San Diego sits on one of the most beautiful and hazardous coastal areas in San Diego. Use caution when visiting the beach. 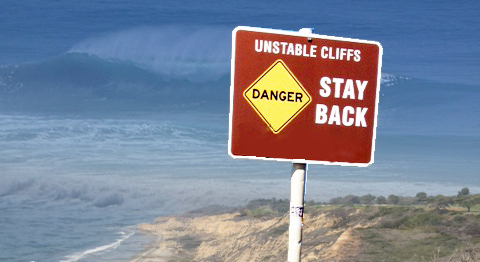 The cliff walls and rocky terrain — from Torrey Pines State Park south to Scripps Institution of Oceanography — can present hazardous conditions. Some trails leading to the beach are unstable. Standing or sunbathing at the base of a cliff on the shore can also be dangerous, especially where rock outcroppings exist. In some places, winter storms and high waves have eroded the shoreline, increasing the chance of collapse and slides. Use only designated trails and pay attention to warning signs. Stay behind fencing and railings — never get close to the edge! Wear proper footwear and look where you step. Ankle sprains commonly occur on trails. Rip currents are strong currents that carry water out to sea. These currents can swiftly carry unwary beachgoers and waders off their feet. It is important to remember that rip currents do not pull people under water – they pull people away from shore. Never turn your back on the ocean and be aware of tide changes. Be cautious at all times for changing surf conditions and swim only at lifeguard protected beaches. If caught in a rip current, don't panic. Swim parallel to the beach until you are out of the current, then return to the shore. Never swim alone even if you are an experienced swimmer.